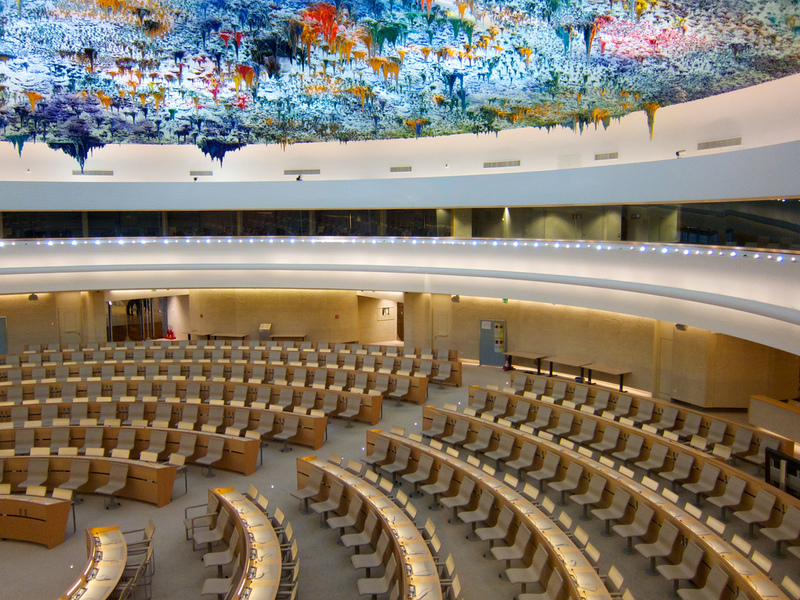 Representing a non-partisan organization such as the British Humanist Association at the United Nations Human Rights Council comes with certain frustrations at the increasingly politicised atmosphere in which we work. The Council was established as the global authority for the protection and promotion of human rights, yet its mandate is often undermined or obstructed by its members, as demonstrated by the recent election of new member states, in which human rights violations are not only commonplace but legally sanctioned. Similarly, the presence and objectives of certain interest groups, such as the new, moral-sounding Friends of the Family coalition, seem to run counter to the principle of universality that human rights are based upon. However, despite despairing at certain elements of the Council, the past session has been an undoubted success for the BHA, with four formal speeches being delivered, one State reply, international media coverage, a film premiere, and positive connections being made with a range of other like-minded NGOs. This speech was reinforced by the International Humanist and Ethical Union, who spoke on the importance of reference to non-believers in UN documentation. ‘There is no legitimate justification that can be used to undermine the universality of human rights. Fetishizing the origins of homosexuality negates from the fact that imprisoning someone on the basis of their sexual orientation is a violation of human rights, including freedoms of expression, association and assembly. Article 1 of the ICCPR states that there will be no distinction ‘of any kind’ in the application of human rights. Human Rights Council Resolution 17/19 is the international agreement to prioritize equality for LGBT. The Nigerian response hinged upon misquoting our speech, and the fact that their bill was voted in democratically, yet did not address our principal arguments that any discriminatory legislation – regardless of how it is passed in to law – violates international human rights law. Our third speech addressed the abuses of freedom of religion or belief in Malaysia, the gravity of which is often underestimated. Just last week, for example, 114 Shias were arrested for commemorating a Shia festival – including a four-month-old infant. Registration of religion on state identity cards is obligatory, and only certain classical religions are recognised. Ethnic Malays are automatically considered Muslim: conversion is almost impossible, and apostates subjected to punishments such as enforced rehabilitation. A fatwa declaring Shia Islam a deviant ideology has been incorporated into the legislation of 11 of Malaysia’s 13 States. ‘Offenses against religion’ are punishable by up to three years in prison and a $1000 fine. Proselytizing is constitutionally restricted to Sunni Muslims by Article 11.4. We joined the international call for constitutional amendments, emphasizing that ‘Malaysian legislature remains the greatest obstacle to freedom of thought and its concomitant rights.’ Unfortunately, Malaysia refused to accept the recommendations made by both states and NGOs regarding freedom of expression and freedom of religion or belief within the country. This speech chimed with the screening of Honor Diaries that we co-sponsored with US Center for Inquiry and the International Humanist and Ethical Union. The film explores the concept of honour and its impact on equality (or the denial thereof) for women. The screening was followed by an engaged and practical discussion on how best to promote gender equality, with Paula Kweskin, the producer, and Raheel Raza, one of the activists featured in the film and a representative for CfI, as panellists. Raza was also able to present the High Commissioner for Human Rights, Navi Pillay, with a scarf signed by hundreds of women calling for gender equality. Humanist principles are repeatedly proven to be deeply intertwined with human rights. At the Human Rights Council, we will continue to advocate these principles in the creation and implementation of international legislation; such that one day all people are able to fully enjoy the basic rights established in the UDHR more than sixty years ago. A/HRC/RES/17/19, adopted by the Human Rights Council in June 2011. Freedom of Thought Report 2013, International Humanist and Ethical Union, p.146. Available to download http://freethoughtreport.com/download-the-report/. This report also noted that ‘The state governments of Kelantan and Terengganu passed laws in 1993 and 2002, respectively, making apostasy a capital offense. Apostasy is defined as the conversion from Islam to another faith. No one has been convicted under these laws and, according to a 1993 statement by the Attorney General, the laws cannot be enforced absent a constitutional amendment’. While the legality of these laws is unclear, they are demonstrative of the attitudes held by some Malaysian states regarding religion.